In addition to doing the ‘ukulele rockstar thing (ha!) I also help run sound at the local theater in my town (and for all my own gigs). It’s a beautiful venue and we have a pretty good in-house PA system. But sometimes it’s the musicians who are playing that are the limiting factor. Here are some tricks and tips I’ve picked up along the way from trying to make them sound as good as possible. Sometimes all it takes to make your ‘ukulele pop on a PA or amp is the right tweaking of key frequencies. I’ve found over the years that cutting around 200-400hz range can really clean up the “mud” that sometimes comes from amplifying a wooden box. Boosting around 1.5-2khz adds a bit of crispness to the high end and can make the ‘ukulele cut through better. In general, it’s better to EQ down instead of boosting, if possible. Experiment. You might find that cutting at 200hz gives the impression of boosting the high end. A pickup running on less than full batteries handles the signal much more poorly than one that’s topped up all the way. So if it’s a big gig and you want to sound your best, change your juice even if you think your battery is fine. And please – bring a spare just in case! 3. Play Like You Mean It! ‘Ukulele pickups are finicky beasts that are far from perfect. The louder you turn them up, the more squirly they get. Feedback, mistakes, and random noises get emphasized with more volume. So, if you can, try to attack the strings a bit more than you might so that you are sending out a stronger signal that doesn’t need to be turned up at the board quite as much. For instance, the other ‘ukulele player in my band doesn’t use picks or nails – which is fine – but he also has a very light touch. So by the time his ‘ukulele is loud enough to be heard, it’s feeding back and if he accidentally plays harder than he intended it’s super loud. A compressor can help this, but shouldn’t be necessary. A preamp usually isn’t necessary, but can often do wonders for your sound. Having a tool specifically designed to balance the signal and prepare an ‘ukulele for its run to the PA can really help. A bonus of a preamp is that it often acts as a DI box. By using this feature you can use an XLR (mic) cable to run to the board. XLR is specifically designed to carry a quiet, balanced signal no matter how long the cable. A 50’ instrument cable will loose a lot of signal. So use the XLR when you can. 5. Sing INTO The Mic! 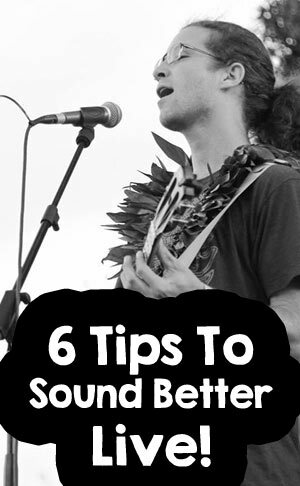 Not for making your ‘ukulele sound better, but making YOU sound better. It’s only possible to turn a mic up so far before it starts to feed back. But it’s (almost) always possible to turn a mic down. So for your sake and the sake of your sound guy – sing into the mic! Yes, you sound different through the speakers. Yes, you probably don’t like it. Get over it if you want to be heard! A good rule of thumb is a two-finger-width gap between your lips and the mic. At loud gigs I kiss the mic all night. Sometimes you have to. Most mixers have a low-cut/high-pass (same thing) button on each channel that ramps off the low end under a certain frequency (usually 80hz). There is virtually no useful sound produced by an ‘ukulele below this point so you might as well get rid of it. Same for microphones. Just by enacting a low-cut on several ‘ukuleles or mics you can really clean up your PA mix and avoid low-end feedback.